I see these pontoon boats with enclosures that allow for camping. Anyone have any experience tips or warnings about this type of camping? Same question about power boats and sail boats with cuddy cabins? Lately I keep thinking that this kind of camping would be cool. Still, boats are even more expensive and maintenance than RVs. Your thoughts?? I have seriously considered buying a pontoon boat.. seriously. I have seen the boats with the enclosures.. with small kitchens and sleeping areas. I don't think I wanna combine camping and boating in that way. 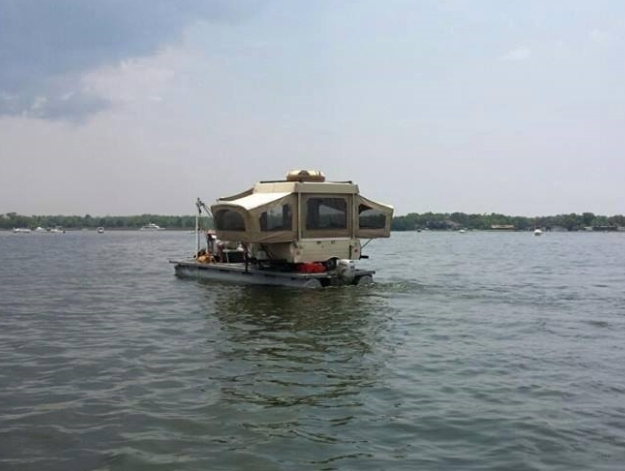 I would love taking a pontoon boat to a nearby campground (on the lake) and then pulling the camper up too. But i wanna be able to get off the boat and relax when the sun goes down. Don't wanna be on the boat if a thunder storm comes up. I am within 30 mins of BIG RIDGE STATE PARK.. the campground is right on the lake.. and there is a boat ramp next to the campground. I have seen campers put their boat in the water.. then, while they are at the CG,.. the just run it up on the bank and tie it off. one more thought.. the biggest part of the maintenance on a pontoon boat.. is the motor. I am not at all mechanically inclined when it comes to engines. I would have to pay someone to work on it. My family had a boat in one form or another for years. Dad had a 48ft houseboat, sister had a pontoon boat, and I had a ski nautique and a bass boat for years. If you camp on your pontoon boat, tie up or anchor very close to the bank with your running lights on, preferably in a cove, if you want to camp out on it. Some idiot (like me) might come screaming up the lake at night in their bass boat. That's how bad things happen. Boats are great and as with any recreational vehicle there are maintenance and upkeep costs. You might come close to breaking even. You don't have any campground fees on the lake but you use, or can use, a lot of gas. A joke around our family was... A boat is just a hole in the water you throw money into. But if you enjoy it it's worth it. I have owned several fishing boats and had an old Aristocraft ski boat. They were on par with Miss Danger, so a lot of our water-ski and fishing trips were spent at the landing, working on the motor, or else out in the middle of the lake, working on the motor and praying we don't drop anything critical into the water. So Chuck, you have a point there. Good point on the traffic, waves and such from other boats, day AND night, Nomad. I watched Ship-Shape TV today. That show always reminds me how much work it takes for a boat to run good, accessories work good, and for the boat to look good. Chuck, I like your point about relaxing and having room to move around in the campground. On that boat your campground is huge, but your campsite is the size of the boat and that's all the walking around room you get. Still, way off in the distance, I hear a boat out there calling me. Maybe after I buy Frickin Chicken from Dave I can consider it. My bank account is earmarked for him right now. LOL.... Seriously, Pontoon would be the way to go, but they aren't the kind you take home... requires a slip and with fees around 50-60 a month, I'd rather pull my camper home and save that money for reservations. You got that right. I never thought about slip rental. Expense after expense, huh? Probably a lot cheaper to just rent a pontoon once or twice a year. That SeaLander looks like the worst of both worlds.